At the most basic level, grilling means cooking food over a hot flame. There is a huge range of grills available, from a modest $20 charcoal grill to a built-in $15,000 gas grill, but the essentials never change. Once you learn the proper way, it doesn't matter what type of grill you use. Keep your grill grate clean to prevent sticking. Give yourself plenty of time; prepare and heat up the grill before cooking. Always keep an eye on what you’re grilling. Do not use spray bottles of water to control flare-ups. Flare-ups are caused by too much fat and too much heat. Trim excess fat beforehand and when you flip the meat, move it to a different part of the grill. Have the proper grill tools to do the job. Oil the food, not the grill. Oil burns away at high temperatures so it is pointless to oil the cooking grate. Spice your food at least an hour before you grill to allow the flavor to sink in. Do not add sugary sauces or marinades to meat on the grill since this causes burning. Place grilled food on a clean plate. Keep your grill away from anything flammable like lighter fluid, fences, your house, etc. A hot grill will yield a high temperature, cooking food hot and fast. For thin cuts of meat and smaller items like kebabs, steaks, chops, burgers, and hot dogs, turn up the heat and cook them quickly. The fast pace means you need to keep a close eye on the grill and more importantly, the food. Hot and fast, however, isn't the way to grill everything. Fish, chicken, vegetables, and fruit are better grilled at lower temperatures; aim for medium heat with these foods. For a gas grill this means reducing the temperature and for charcoal, it means building a smaller fire. You still need to watch these foods closely, but they generally take longer to cook at a lower temperature. A common grilling myth is that you shouldn't turn grilled foods too frequently. Flip when you need to; you want even cooking. 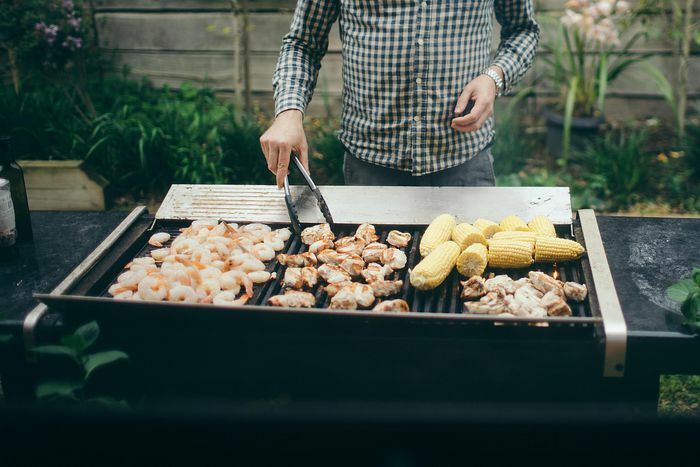 Move your foods around the grill and take advantage of the space to avoid flare-ups. However, don't be alarmed since flare-ups are bound to happen, especially with high-fat foods like steak. Certain foods benefit from being cooked away from the heat source, using indirect heat. This means having the fire on one side of the grill and the food on the other. It works well for large foods like whole chickens, beef roasts, racks of ribs, and any other poultry or meat that needs a lot of time to cook. Indirect grilling allows you to successfully cook through the middle of the protein before the outside burns. If you have a large grill with several burners, it is best to place food in the middle and light the burners on either side. If your gas grill is too small for this setup, place the food on one side and light the burner on the other. You will have to rotate the food to ​cook it evenly. Law 1: You can cook longer, but you can't "uncook" food. Law 2: Undercooked meats can kill you. Law 3: Trust and verify. Experience is the best tool you have when cooking to a proper doneness, but a meat thermometer is necessary to make sure you have it right. Uncover your grill and turn on the gas supply. Turn on the control valves to high and light the grill (follow your grills instruction manual). Preheat your grill. A good grill should be hot in about 10 minutes. Take a grill brush and clean off the cooking surface. Place your food on the hot grill and remain at your grill. Food will cook quickly; if you leave, you run the risk of burning the food. Flip when necessary and remove when done. Leave the grill running on high for a few minutes. Take your grill brush and clean off the cooking surface. Turn off the control valves and fuel supply. Allow the grill to completely cool and replace the cover. Most gas grills work best with the lid closed. The lid needs to be down to generate the intense heat necessary for high-temperature grilling. Indirect grilling also requires the lid to be down. Charcoal grilling is much more an art form compared to gas grilling. It gives you a more authentic grilled flavor and cookout experience, but it isn't as convenient or predictable as cooking on a gas grill. With a charcoal grill, no matter how expensive or fancy it is, there is no temperature control valve. You control the heat by the way you build a fire, how you adjust the vents, and how you good you are at keeping the lid on. It does require more learning and mastery, however, it is just as versatile as a gas grill. Charcoal grills can reach temperatures above 700 F or maintain temperatures around 200 F. You can sear a steak and still cook low and slow. Many charcoal grills even have rotisserie options. Successful charcoal grilling requires more than just the grill and the charcoal. There are several factors to keep in mind when charcoal grilling. Keep the charcoal grill clean; ashes and debris block vents and make fire control difficult. Make sure the vents work; rusted or corroded vents are hard to adjust. Own a pair of fireproof gloves. Charcoal grilling requires you to touch hot things; be prepared. Have a charcoal starter to help light charcoal. Put the grill in a safe place where it cannot be knocked over. Keep grilling tools close by. Have a good stick nearby to move burning coals around inside the grill. Stay patient. Charcoal grilling is a long process. Practice. Charcoal grilling takes time to master but is worth it. Unlike a gas grill, you cannot just "turn on" and "turn off" the heat with a charcoal grill. "Turning on" requires you to build a fire, and "turning off" means you have to properly shut down the grill. A good charcoal grill can be shut down when you are done by closing the lid and the vents. The lack of oxygen will stop the charcoal from burning. That doesn't mean the charcoal is cool enough to handle; those coals will stay hot for up to 24 hours, so don't dump hot coals in the garbage or you can start a fire. Even a tiny ember can ignite a fire, so properly extinguish ashes before disposing of them. Another option is to save the remaining charcoal. When you are done, remove the cooking grate, stir up the charcoal, replace the lid, and close the vents. Next time you grill, add fresh charcoal to what was left behind and light. If you are careful, you can cut your charcoal consumption in half and save yourself some money. When it comes to choosing a type of charcoal, keep it clean. There are a lot of charcoals with additives. It's better to buy natural charcoal without chemicals and light naturally with a charcoal chimney, electric starter, or natural charcoal lighters. Your food will taste better and you won't fill the air with fumes. Light the charcoal, then spread it to build your fire. Charcoal takes about 10 to 15 minutes to reach the proper temperature. When charcoal is ready for grilling, it will have an ashy coating all around, appear white or gray, and be very hot. For a medium fire, spread your charcoal in a single layer on the coal grate. For a hot fire, light enough charcoal for a double layer of coals on the coal grate. For an indirect fire, once the charcoal is ready, push all the charcoal to one side of the coal grate and cook on the other side of the grill. No matter the method, the goal of grilling is to enjoy yourself and cook delicious food. Take your time, set yourself up for success, and keep trying.